Tattoos in society are becoming increasingly common, as are the detail and complexity of them. Some tattoos are stunning works of art. Others, however, are not and studies have shown that up to 25% of people experience “tattoo regret” about all or part of a tattoo. This is where laser tattoo removal comes in. This may be because the tattoo does not look like what they had expected, it may have faded or stretched with the skin, or the tattoo may be associated with someone or something negative from a person’s past, such as an ex-partner or a bad experience. Who can use a laser in Western Australia? In Western Australia, only a medical doctor can own and operate a laser powerful enough (Class 4 laser) to remove a tattoo. These lasers are the only safe and effective method of removing a tattoo. We would urge anyone who is considering getting a tattoo removed to ask their provider about their qualifications and the brand of laser that they are using. Non-laser methods of removing tattoos are ineffective and dangerous and unfortunately the non-laser tattoo removal industry is unregulated. What laser is used for laser tattoo removal? At Rewind Skin & Laser, we use the Picosure laser which has been the gold standard for tattoo removal against which all other lasers are compared. Laser technology has evolved over the last few years to make laser the only effective way to remove tattoos. The laser emits a burst of light at different wavelengths which is absorbed by the tattoo ink. The laser beam is so fast (in the case of Picosure it hits the skin in trillionths of a second) that the light energy is converted into physical energy which causes the ink particles to shatter. The body’s lymphatic system then clears these particles out of the body over the following 6-8 weeks. Why is laser best for tattoo removal? Laser is the only effective tattoo removal treatment as it has the ability to remove the tattoo ink without causing skin damage or scarring. Over the last few years, various therapies such as dermabrasion, injections and chemical treatments have come on the market with their practitioners making amazing claims that they can clear tattoos. These treatments do not work and invariably only cause skin inflammation and scarring to varying degrees, while leaving the ink behind. The team at Rewind Skin & Laser would advise patients to never consider these treatments. Are all tattoo lasers the same? It is very important for consumers to know that there is a huge difference in the effectiveness of lasers on the market. Only the most powerful and advanced Class 3B and Class 4 lasers, which are built in North America and Europe, are allowed to be sold to registered medical doctors in Western Australia. 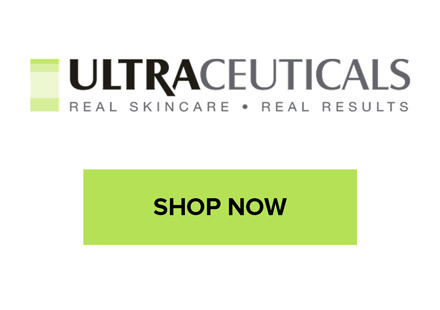 These machines are extremely expensive (several hundreds of thousands of dollars) due to the extensive research and development, clinical testing and patented technology that has gone into them. Non-medical practitioners are able to purchase cheap, low level lasers mostly from China and Korea that are not powerful enough to treat tattoos effectively and safely and also usually have not had any clinical trials or safety checks carried out on them. Unfortunately, the marketing behind these companies and practitioners promises great things but under-delivers. We would always advise patients to question practitioners about their qualifications and training and the brand of their laser. Can all tattoo colours be treated? The Picosure laser has been the gold-standard in tattoo removal since its introduction due to its ability to treat all colours safely and effectively. All other lasers struggle to remove greens and blues whereas the Picosure can achieve full clearance of all colours. This is through its patented Picosecond 755nm wavelength technology to treat blacks, blues and greens and its 532nm wavelength to treat all other colours. Different coloured inks tend to settle in different depths of the skin. Black ink settles the deepest in the skin, blues and greens settle mid skin and reds/ranges settle at the surface of the skin. To treat different ink colors, a laser needs to have different wavelengths to properly target each color and its depth within the skin. The two critical factors when discussing tattoo removal lasers are the colours of ink that are treated by the different wavelengths of laser and the depth in the skin that the different wavelengths penetrate. As discussed above, the 755nm and 532nm handpieces on the Picosure are effectlvly able to target all tattoo colours; the 755nm being the best to target blacks, blues and greens, while the 532nm target reds and yellows. All tattoos are different and the number of sessions will depend on the age of the tattoo, the depth of the inks, the type of inks and whether it was a professionally done tattoo or done by an amateur. 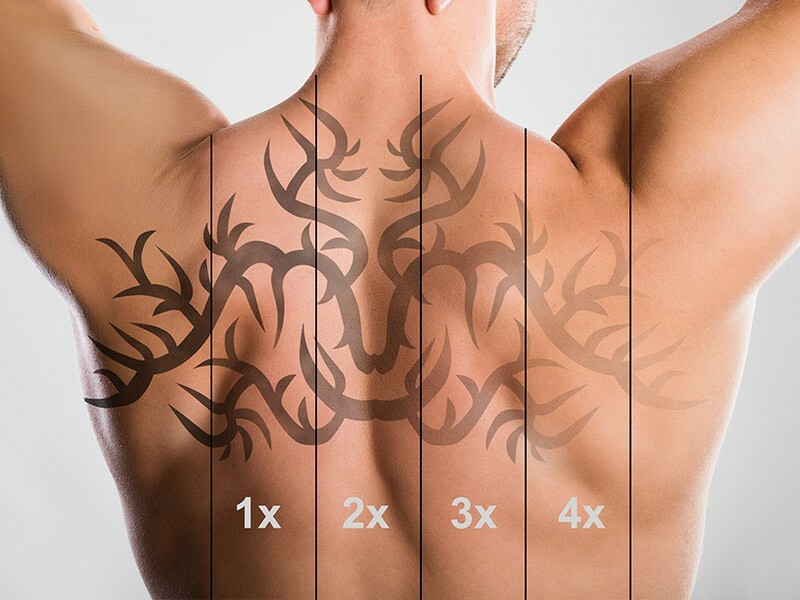 With older nanosecond Q-switch lasers, tattoos would have needed 12-20 sessions, with the Picosure the number of treatments needed is approximately halved, with 6-10 treatments needed. Laser tattoo removal feels like a “rubber band hitting the skin” and can be uncomfortable. We recommend topical local anaesthetic cream for all tattoos except that smallest ones. We also use a Zimmer, a special machine that cools your skin down to increase your comfort levels. 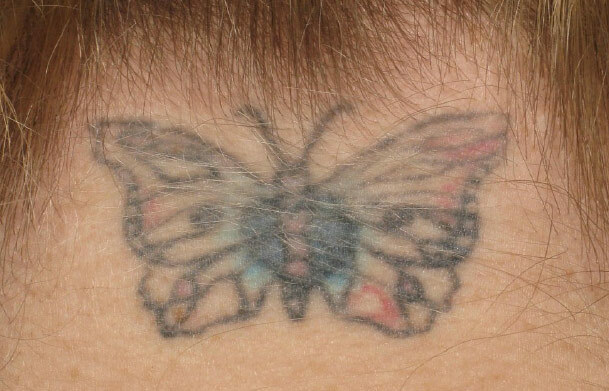 What can I expect to happen to my tattoo after treatment? Immediately after your treatment, your tattoo will feel swollen and warm, a bit like sunburn. We will apply soothing cream and a dressing before you leave the clinic. Over the next few days, you may develop blisters and scabs which are a normal part of the process and nothing to be worried about; they normally last up to a week. How do I care for my tattoo after my laser treatment? We recommend that you apply a healing ointment such as Bepanthen or Stratamed over your tattoo and cover it with a dressing for up to a week after treatment. This should be continued until any blisters or scabs have healed. This will promote healing of your tattoo. Scabs should not be picked off as this may cause scarring. Once any blisters or scabs have healed, the tattoo should be kept out of the sun or SPF50 cream used when outside. How often can I have my treatments done? After your laser treatment, it takes 4-6 weeks for your immune system to clear the shattered ink particles through the lymphatic system. It also takes this long for your tattoo to heal at a microscopic level, even though the skin and tattoo may look fully healed to the naked eye. We therefore recommend a minimum of 6 weeks between treatments. There is no advantage to getting treatments more often than this and it will not speed up the removal process. Yes of course. The laser beam is extremely accurate so we can accurately remove part of the tattoo. We often do this for people who feel part of their tattoo was done incorrectly or to a substandard level, if there is a mistake or if they want to get a partial cover up tattoo done. Can I have my tattoo faded just enough for a cover-up tattoo? Yes, we often do this for people who want a cover up done. The number of treatment sessions needed will depend on the individual but generally 3-6 sessions will be enough to fade a tattoo ready for a cover up. Using the Picosure to achieve this will also ensure your skin is in the best condition ready for another tattoo. Why should avoid other methods of tattoo removal? There are other methods of removing tattoos that are marketed as being effective but in our experience people should avoid them. Treatments such as injection, peels, creams, acids and other non-laser treatment carry a high complication rate such as scarring and do not effectively remove the tattoo. This treatment involves using a caustic substance to chemically burn the skin in an attempt to remove the tattoo ink. This method cannot selectively target tattoo ink; it destroys healthy skin along with ink, causing severe scarring that may still leave ink behind in the skin. This scarring is generally irreversible and the appearance of it is generally much worse and more noticeable than the original tattoo. Chemical burns and scarring look like cigarette burns and are one of the commonest complications that we see from these treatments at Rewind Skin & Laser; unfortunately we can only improve them and not completely get rid of these severe scars. Injection of saline or other substances into the skin are marketed as an effective way to remove tattoo ink. However, these injections have little effect on tattoo ink and their effect, at the very least, is to do nothing or in the worst case scenario, to cause irreversible scarring. Dermabrasion can only remove tattoo ink if enough layers of skin are removed to remove the ink within it. 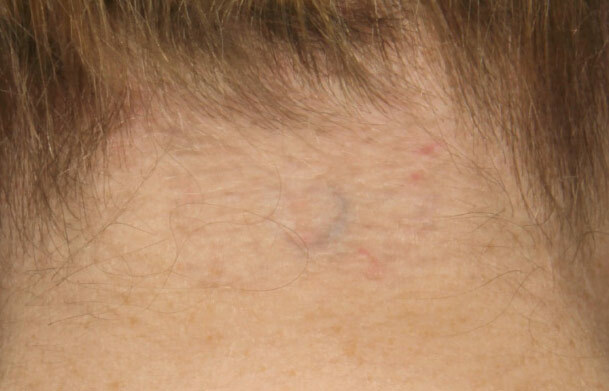 To achieve this would need removal of skin down to the deep layers (dermis) which will cause irreversible scarring. Dermabrasion cannot selectively target tattoo ink and therefore we cannot recommend it. Similarly, any kind of surgery to remove tattoos needs to remove enough skin which will leave scarring or the need for a skin graft. See the results achieved with the Picosure Laser Tattoo Removal system. Cost of laser tattoo removal varies by the size of the tattoo. Prices start at $200, book a no-obligation consultation for more information on removing your tattoo. At Rewind Skin & Laser we operate to the highest standards and we are an independently owned and operated clinic, by doctors who have your safety as our first priority. We ensure proper follow up and aftercare of all of our patients and have years of experience with Picosure laser tattoo removal.